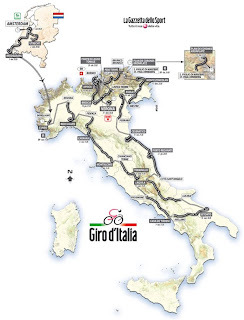 The 2010 Giro d'Italia , the three-week Grand Tour around Italy begins tomorrow! You can catch all the action on the Universal Sports network, they are providing the live broadcast of the race this year. Coverage begins at 10 a.m. (ET) every race day, and then at 8 p.m. (ET) there is a rebroadcast. On the two rest days, Universal will offer a review of the week's action. Also, both CyclingNews and VeloNews will offer live coverage. La Gazzetta dello Sport also is offering coverage in English. The race features three days in the Netherlands that lead into six mountain stages that include the Gavia, Mortirolo, Terminillo, Zoncolan, Plan de Corones and Pejo Terme, Seven sprinters' stages and four time trials (one to open and one to close, one in the mountains and one team event) While plenty of action is promised early in the bike race, the final eight stages will set the tone with four mountain stages and two time trials. 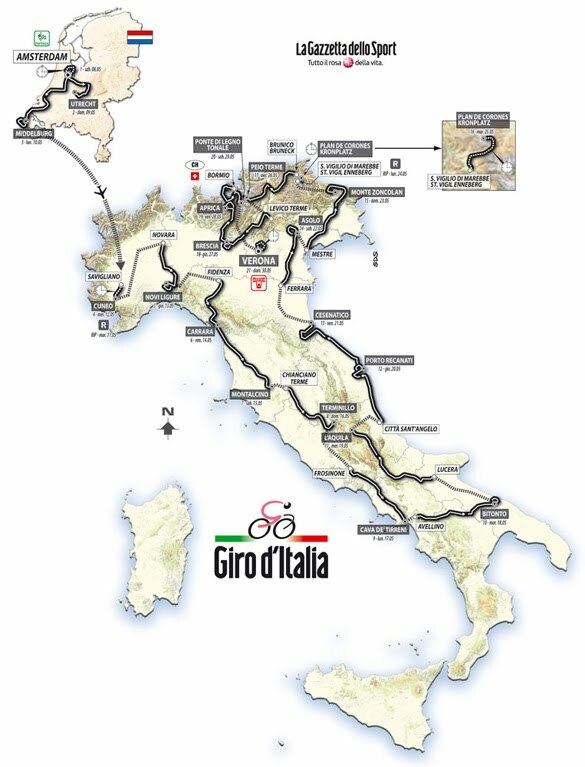 The scheduling of two major events in May means that cycling teams and racers have to choose between two events – The Giro and The Amgen Tour of California, scheduled for May 16 – 23. For example, Lance Armstrong, who competed at the Giro for the first time ever last year, and sprinter Mark Cavendish have opted to race in California. Talk of the Giro beginning in Washington, DC in 2012 continues to swirl in hopes of garnering more interest for the race in the states. The next three weeks of my life? - mimosas, coffee and simulcasts of the Giro and the Tour of California! I suggest you do the same!